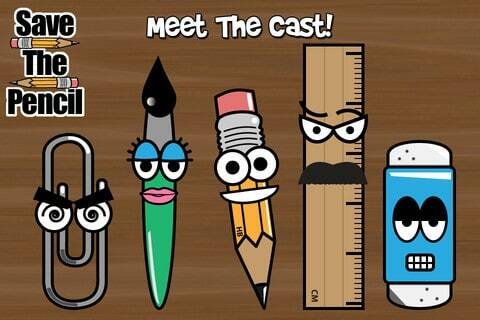 Save the Pencil is currently a game for the iPhone and iPod Touch devices that is number one in the UK app store. The game is a strange concept in which you play as a pencil and your mission is to save the pencil from the various elements of the game. The game is extremely fun and addictive and reminds us of those popular games such as Cut the Rope and Angry Birds in the way that you will most definitely get carried away with it. The game as a whole will require logic and skill in order to get through the various levels, of which there are a total of 60. There are four different chapters of the game and you will be ranked1 to 3 stars on every level of the game. Only those that are the fastest and are extremely logical will be able to gain 3 stars on each of the levels. One of the great things about the game is that it has been optimised for the Retina display of the iPhone and iPod Touch and therefore looks absolutely fantastic. As well as this, it has full game centre integration so you will be able to keep in touch with your friends and see how your scores stack up against other players. There are end of chapter bosses too with this game which adds a really nice element.